Under the heading don't believe what you see in the paper.....On this day in 1948, Harry Truman went to bed thinking he'd lost the Presidential election to Thomas Dewey. The numbers looked so bad that the Chicago Daily Tribune made a guess as to who would win. They guessed wrong. 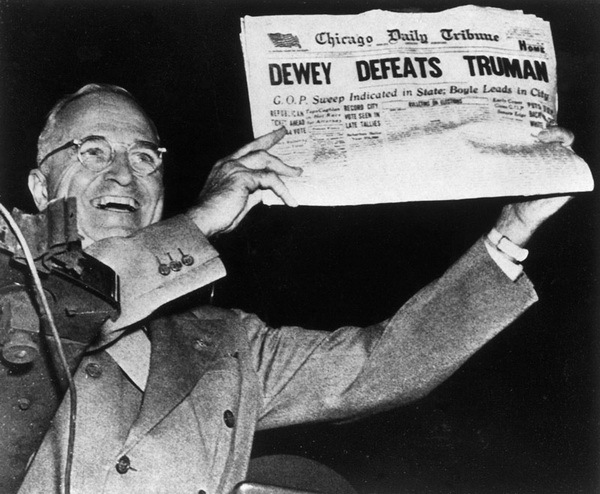 Truman woke up the next morning to find the headlines congratulating Dewey, but Truman was the President. Ah, journalism. Makes your heart sing, doesn't it?? 1889, North AND South Dakota were admitted to the Union. And that's what I've got.......Let's hear from you guys! Or are you all on Twitter now??? n 1947, Howard Hughes piloted his huge wooden flying boat, the Hughes H-4 Hercules (derisively dubbed the "Spruce Goose" by detractors), on its only flight, which lasted about a minute over Long Beach Harbor in California. In 1889, North Dakota and South Dakota became the 39th and 40th states. In 1984, Velma Barfield, convicted of fatally poisoning boyfriend Stuart Taylor, was put to death by injection in Raleigh, N.C., becoming the first woman executed in the United States since 1962. Paula Radcliffe defended her title at the New York City Marathon to become the second woman to win the race three times. an FYI...On CNN this morning, reporters touted the first MAN to win NYC Marathon it in 27 years! And he was an Olympic athlete! The women have done that for YEARS. lol. Go Girls!! Go girls on the marathon! Though why anyone would run if they weren't being chased by a knife wielding maniac is beyond me!! Wonder why Velma did in ol' Stuart?? I wondered too, about Velma, so I looked her up. It turns out she was afraid that Stuart had discovered she had been using his account to forge checks with. She had also poisoned a few people before him. It seemed to be her method of choice. Nice piece of detective work there, Pat!! Makes you wonder what Stuart saw in ol' Velma now doesn't it?? Lacey, I know!! Incredible little piece of journalistic history, huh? ?